Earthquakes happen every day in California, most in remote areas or deep beneath the surface. When a major quake occurs, it can not only cause severe structural damage in a building, but can also cause the building’s collapse. When the earth shakes, the amount of structural damage will vary depending on the building (how well it was built), and the degree and type of ground movement. The severity of ground movement usually coincides with the building’s proximity to the earthquake’s epicenter. For example, a magnitude 7.0 quake will be only 50% as strong 8 miles away from the epicenter. The strength of the shake can also be affected by the type of rock the seismic wave passes through, and soil conditions. Soil that is soft and wet will increase shaking. Duration of the motion can influence the amount of damage as well. Buildings that shake for longer periods of time typically have more damage. There are many complex issues involved in how a building moves during a quake. Visually, when the base of a building moves to the left, the rest of the structure appears to move to the right. In fact, the building’s move to the right is simply a resistance to the motion occurring at the base. Other factors that influence movement include seismic load, soil conditions, building material strength and building design. An important aspect of design is the structure’s ability to bend or sway when the ground beneath it moves. Even a building that has been designed to withstand ground motion can fail if the foundation is weak or damaged. Certain types of foundations are also more likely to result in damage, such as structures built on columns. This is usually because of uneven settlement. When a new building is constructed, it must adhere to various regulations designed to minimize quake damage. Older residential and commercial buildings however, need to be inspected to determine their ability to withstand a quake. Most of these structures will need to be strengthened. Earthquake retrofitting is the term used to describe the process of modifying a building to make it more resistant to seismic activity. Types of retrofitting include foundation bolting, cripple wall bracing and the installation of brackets. Foundation bolting strengthens the connection between a structure’s frame and the concrete foundation. Some structures have no bolts, while others have an insufficient number of bolts or bolts that have become weakened over time. Knowing what types of bolts to use and where to place the bolts is extremely important. Cripple wall collapse is one of the main causes of earthquake damage. 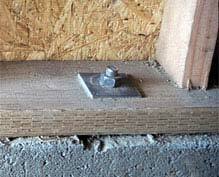 The failure of a cripple wall will cause the floor of the home to drop to the ground. Braces can be used to strengthen cripple walls. In most cases, these braces will need to be placed on all sides of the home. Hold-down brackets are used to anchor shear walls, and help prevent the wall from rolling or shifting. If you have an older home, request an inspection from a foundation repair expert. An experienced foundation contractor can determine if your building needs retrofitting to prevent damage during an earthquake. You can minimize the risk of structural damage with the right retrofitting techniques and materials.